Fred Gaisberg made 476 Chinese recordings in Shanghai and Hong Kong in 1903. These records were first sold in China through S. Moutrie & Co. The arrival of these records was announced by an advertisement in the Shanghai daily "Shen Bao" on July 10, 1903, just four months after Gaisberg ended his recording trip to China. 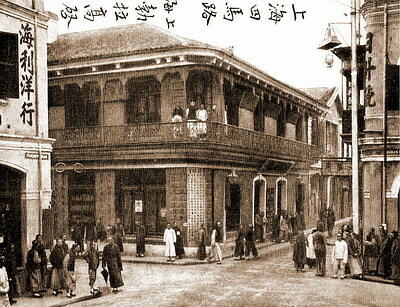 In 1906, S. Moutrie & Co., as an official agent for Victor for the entire Chinese market, started selling Victor's gramophones and records through Foong, Yuen Sing who operated this business from the office of S. Moutrie & Co. Ltd., in a building at 3 Nanking Road, near Nanking Road and the Bund (a Huangpu River beach) corner in Shanghai. Some of these recordings were continuously re-issued by Victor in the United States in the 6500, 6800 and 42000 series. According to Ted Fagan and William R. Moran's book The Encyclopedic Discography of Victor Recordings - Pre-Matrix Series, and some actual discs in my collection, 69 records in the A-6501 to A-6569 series were re-issued as 7" discs and 61 records in the A-6800 to A-6862 series were re-issued as 10" discs in 1904, with the yellow "Velly Good Talkee" trademark label. 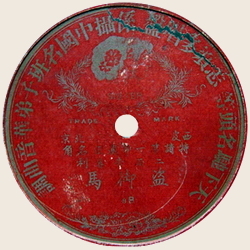 There were another eighteen of these re-issues, of music from Shanghai, that were issued with yellow "Yi Cuo" labels in 1908. 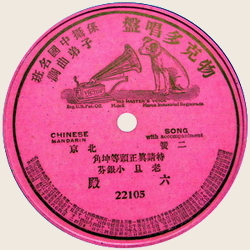 G&T Chinese records issued before 1908 were made in Hanover, Germany, but by 1908 some were made in Hayes, England, after its commercial pressing operation started in July 1908. Issues after 1909 were made by Gramophone's Calcutta factory, which was officially opened in December, 1908. Following Fred Gaisberg's first recording trip to China in 1903, G&T often sent its recording experts to the Far East for recording purposes. In March, 1905, eighteen recordings in the Tibetan language were made by William Sinkler Darby in Calcutta. During January, 1909, some Chinese recordings were made by another G&T expert, George Walter Dillnutt, in Singapore and Macao. Forty-eight records made in this session appeared in a G&T catalogue issued in 1909. These records used matrix numbers from 10356o to 10407o (Fig. a) and were issued in the 7-12000, 7-13000 and the 7-14000 series (Fig.1). In March, 1910, Dillnutt recorded forty-two Chinese discs in Bangkok using the same series numbers as those of 1909. In late 1911, Max Hampe recorded another lot of Chinese records in Singapore, Hong Kong and Macao using matrix numbers either in the 10XXX or the H10XXX series (Fig.2). In 1906, William Gaisberg visited Hong Kong to make some Cantonese recordings, but the actual number he made is uncertain. 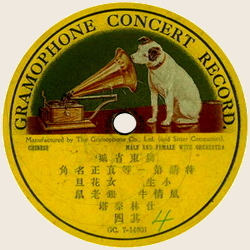 From around 1915, Chinese records started to have an HMV label. Under the old social system of the late Qing Dynasty, men's social status was much higher than women's - men were greatly respected and women were not respected. Music was mainly performed by courtesans in metropolitan tea houses, taverns and brothels, but for those people who did not live in the bigger cities, performances were given in open-air theaters (Fig.3). The Chinese opera recordings were made by males, while the recordings made by courtesans were of popular tunes. 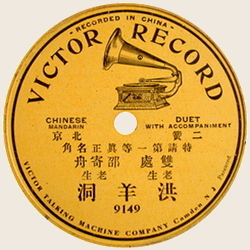 While Victor first made recordings in China on 10" discs in the 7324-8299 series in early 1905, the 9100 to 9234 series (which carried matrix numbers from 1001 to 1135) (Fig.4) and the 10000 to 10350 series of 12" records were recorded at approximately the same time, in 1905. The labels on the 12" records had variegated yellow, red, blue and green colours. From 1908 to around 1910, some new recordings were issued in the 22000, 25000, 27000 and 28000 series. The 22000 (Fig.5) and 25000 (Fig.6) series were on 10" single-sided discs and the 27000 and 28000 series were on 12" single-sided discs (Fig.7). 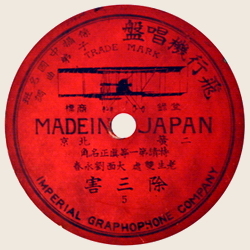 Many of the 10" records were later re-issued by such Japanese recording companies as the Imperial Graphophone Company (Fig.8) and the Sister Talking Machine Co., Ltd., of Osaka, Japan (Fig.9). The Oriental Phonograph Mfg. 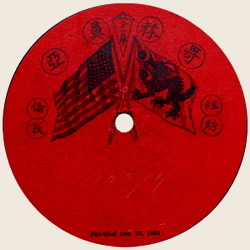 Co., using Chinese records patented by Keiko & Co., Japan, also issued some Chinese discs during 1914-1915 (Fig.10). 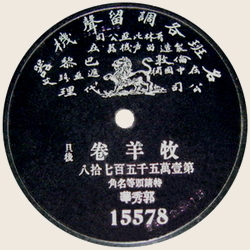 Most early Chinese discs recorded by Columbia were arranged for by J. Ullmann and Co.'s offices in Shanghai and Hong Kong. In June, 1904, to launch a new recording plan by Ullmann and Co.'s offices, Columbia sent Charles. W. Carson, a recording expert from Ohio, to Shanghai. Carson's work was under the direction of a Mr. Stanley, who was then at Columbia's office in San Francisco and later became the manager of the Oakland Branch. 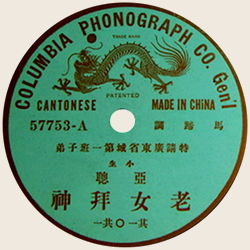 Carson's recording program was also arranged by Stanley, the music chosen by Chinese consultants. Columbia sent all of the recording equipment and accessories to Shanghai aboard the S.S. "Coptic", and the shipment arrived in Shanghai that November. 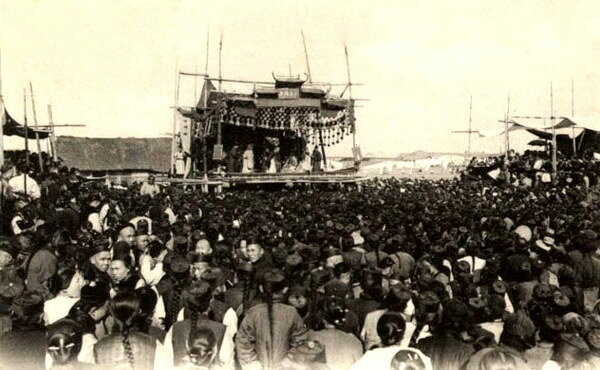 With the equipment received, Carson made recordings of Chinese northern operas in Shanghai until March, 1905, and then recorded Cantonese opera in Hong Kong from April to August of that year. From June 1904 until September, 1905, Carson had spent a total of fifteen months in China, making hundreds of records, but many of them were unacceptable in quality. The Chinese northern operas were issued in a 15000 series with catalogue numbers from around 15500 to 158XX, principally on two different labels. One was with the American flag and Chinese Qing-Dynasty's dragon flag label (Fig.11), and the other was with the name "Ullmann and Co.", the sales agent in China, but in Chinese characters (Fig.12). The Cantonese operas were issued in a 57000 series with catalogue numbers from 57500 to 576XX and the label had a golden Chinese dragon on a red background (Fig.13). Because of problems with masters and grooves, these recordings were not satisfactory to Ullmann. In the meantime, Carson was asked by his headquarters in San Francisco to go to Japan by the first available ship for more recording activity, where he would work together with Harry L. Marker, under the direction of F. W. Horne. In early 1907, Carson returned to Shanghai to complete his unfinished recordings. I believe that the recordings made in this session were issued in a 60000 series with catalogue numbers from 60000 to 605xx for the Chinese northern operas, with a label similar to those of the 15000 series. Around May, he moved to Hong Kong to be an assistant to Harry L. Marker for a new recording session. Recordings made in this session were issued in a 57000 series with catalogue numbers ranging from 57700 to 578XX, and the labels had a golden Chinese dragon on a green background (Fig.14). These recordings covered Chinese southern operas, such as Cantonese operas, as well as those from Amoy, Swatow and Hong Kong. Harry L. Marker spent a year, from about May, 1907, in Shanghai, Hong Kong, Beijing and Tianjin. Part of the time he worked with Carson and part of the time he worked alone. Columbia's other recording expert, Charles J. Hopkins, made a globe-trotting trip from Britain in October, 1903, staying in China for about one month in 1904, but he seemed not to have made any recordings at that time. J.Ullmann and Co.'s offices in Shanghai were located at No. 564 Nanking Road, in Tientsin inside the French Concession and in Hong Kong at 74 Queens Road. All of the recordings cut for Ullmann were sent to the United States for pressing in Bridgeport, CT. by the American Graphophone Company under the direction of T.H. Macdonald. The finished discs were then sent back to China for sale by J. Ullmann and Co., the agent for the Chinese market. The records made in Hong Kong in the 57000 series were of Cantonese and Southern operas, and were targetted to Cantonese consumers in Hong Kong, but also to those emigrees in the U.S., Canada and South-East Asia. Because some were destined for the diaspora market, there was no mention of the name of the Ullmann agency on those labels. Since few in the Chinese diaspora were from northern China, the discs of northern opera were sold only inside China. Pathé's Chinese records first appeared on the Chinese market in 1908. These centre-start discs were double-sided, vertical-cut with an etched-label, and most of them were 11.5" in diameter. They had stamper letters (in capital letters) accompanied by a series number, placed directly below the names of the artists and titles, and the recording dates can be determined from the stampers. The early stamper designations from 1908 to 1909 had the letter "R" accompanied by a series number in the 24000 to 26000 series. Later in that period the letters "N" and "R" both appeared on the 25000 series. Around the 45000 series, the "R" was replaced by the letters "GR", until the 60000 series in 1910. From about the 65000 series in 1911, a new combined stamper designation "RA" appeared on the platter and that was used on the 65000 to the 99000 series, from the years 1911 to 1914. At the same time, the letters "ER" were used in the 82000 series, and the letter "B" was used in the 97000 series, even though for a short time they were both used. Starting in 1914, a new stamper number/letter style was created, the (14)-PM with a code number suffix. In 1915, it was changed to (15)-PM. From 1915 onward, Pathé ceased using the center-start system and was working with their new edge-start discs. 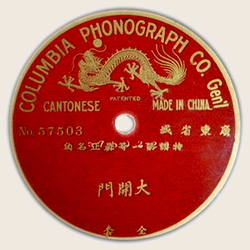 All Pathé Chinese etched-label records carry catalogue numbers either in the 32000 or in the 35000 series. The 32000 series was used for the Beijing opera and for other local operas, while the 35000 series was used for Cantonese operas. 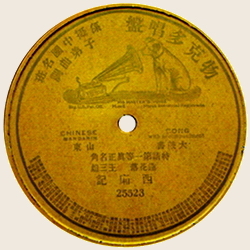 The first Pathé records available on the Chinese market included some 800 Pekinese recordings with catalogue numbers from 32001 to 32758 (some records bore the same catalogue number on both sides, when both sides carried pieces from the same opera, and they therefore appended -1 and -2 as suffixes to the number) and 200 Cantonese recordings with catalogue numbers ranging from 35000 to 35199. 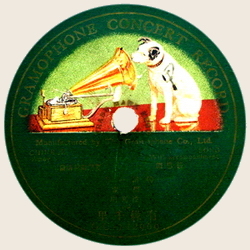 Later, many new recordings were released bearing different Chinese variants of the Pathé tradename on the labels at different times, and the tradename was sometimes translated into Chinese characters as "Compagnie Generale Phonographique Pathé Frères". 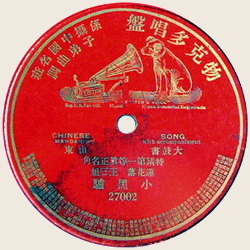 The first Pathé Chinese etched-label records were made in France, as shown by a lozenge stamp on the platters. Later, from about 1910 to 1914, they were pressed in Belgium. All of these discs were recorded in China, their masters sent to France and Belgium for pressing and the finished discs were returned to China for sale. Pathé's office in Shanghai was first located at No. 99 Szechuen and later they had another address at 58 Si Ma Road. Si Ma Road was near Zhong He Li, a place that was bustling and noisy. This area was where most of the famous newspaper offices were, there were tea houses and brothels and the literary scholars congregated there. It was a place both of culture and of prostitution. Because of a tale involving a very famous literary scholar and a prostitute, which took place in that road, the local people called the prostitutes in that area the "La Traviata" of Si Ma Road. Some people thought of it as the birthplace in China of western industrialization and culture in modern times, since it was an area where foreign concessions (including the British concession), foreign commercial offices and publishers were concentrated, all bringing in influences from abroad. A view of the centre of Si Ma Road is shown in Fig. 15. In a letter from Tan Xin Pei to Du Kai (Fig.16), Pathé's representative in China, bragged that Pathé was recording all of Beijing's famous opera artists. 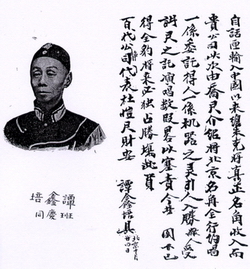 Tan Xin Pei was the most famous Beijing opera artist at that time. He created the Tan artistic style of singing at the Beijing opera and this tradition has been faithfully handed down to his own sixth generation descendants, right to this day. 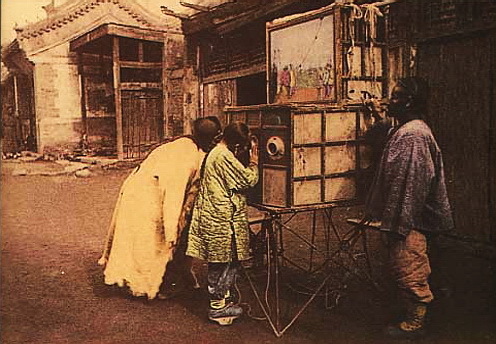 Figure 17 shows a young black man operating his peepshow on the street for two Chinese fellows in the era of the late Qing Dynasty. These two young men with long braids hanging down their backs are looking into the machine with great curiosity. Andrew F. Jones in his book Yellow Music, Media Culture and Colonial Modernity in the Chinese Jazz Age, says that the Frenchman E. Labansat set up a peepshow for Shanghai theatre-goers. If that was indeed the case, the peepshow the young black man is operating could be the very business that Labansat owned before he started selling records on the street in Shanghai. In March, 1910, Japan sent a group to visit the London International Exhibition where they invited the recording expert George L. Holland, an English-American, to Japan to make recordings. Holland was later loaned by Nipponophone Company for a period of five months to make recordings of Chinese performers. 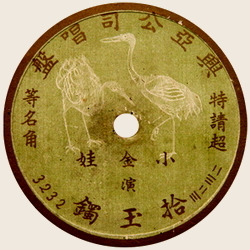 Around March and April, 1914, Holland made approximately 200 recordings in Osaka of people from Formosa (Taiwan) and these discs in a 4000 series were the first recordings ever made by Taiwanese. 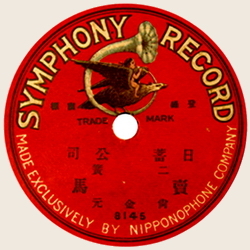 After Holland had finished his recordings in Japan, he cut some 100 records in Tianjin, China, during May and June, 1914, under an arrangement with Nipponophone's office in Dalian. 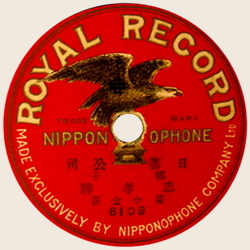 These recordings were issued in an 8000 series with different trade marks, such as Symphony (Fig.18), Royal (Fig.19) and Nipponophone (Fig.20). They are double-sided and 12" in diameter. The masters were sent to Kawasaki, Japan, for pressing, but when the master discs were inspected for clearance at Kobe customs, many were found to be broken. They were able to press only 10,000 records from the surviving good masters, and these discs were sent to Shanghai for sale. 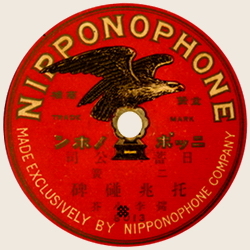 For these discs a special "ENGLE" trade mark was registered in Shanghai by Nipponophone's office at 53 Szechuen Road. Because of low sales, these records were then transported to Taipei. Unfortunately, they still did not sell well there and finally had to be sent back to Japan. A further plan was hatched to send these records to Dalian for a final sale, but a big fire completely destroyed the warehouse where they were stored. The surviving records are extremely rare today. I must express my gratitude to Lee Kuen Chung, a researcher and collector of early records from Taiwan. During the writing of this article, he was kind enough to supply me with a great deal of information about Chinese records made by Japanese recording companies, as well as with copies of the excellent articles that he had previously written.